Central London is full of identikit touristy restaurants, so it’s refreshing to discover a place as unique as Little Water. The clue is in its name: ‘vodka’ is a Slavic word for water, interpreted as ‘little water’. 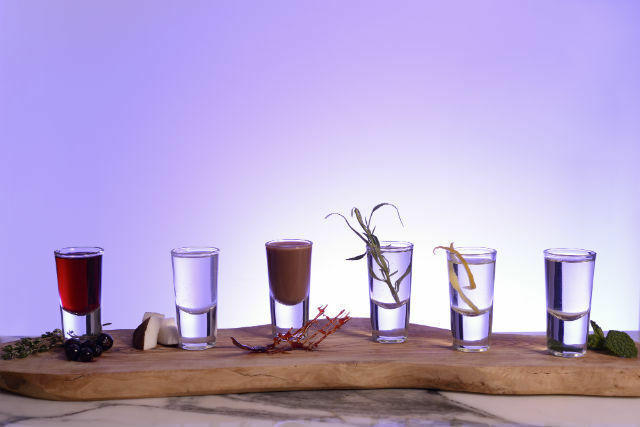 So as you’d expect, the venue specialises in vodka — specifically house-infused ones in adventurous flavours such as sea-buckthorn (very fashionable right now) and charred rosemary. Curiously, they're paired with every dish on a simple but enticing menu of mostly burgers and snacks (which, for vegetarians, include wild mushrooms on toast, mozzarella salad and a cheese board). Whether the vodka and burger matching is designed by a drinks expert or completely at random we can’t say. In fact, we know little about the restaurant except that “it’s probably owned by a Russian lady”, according to our friendly waiter, who was new and still learning the ropes — and neither have we been able to find out more. This is okay, though, as it’s in keeping with the spontaneous, just-discovered-this-kooky-little-place spirit that only adds to its mystique. As we wanted to save room for both vegan burger and the intriguing-sounding ‘chocolate burger’, we decided to miss the starter of vegan feta salad made from nut cheese (in fact both burgers turned out to be quite light). We did ask if we could taste a few of these 'cheese' pieces, but they never materialised. 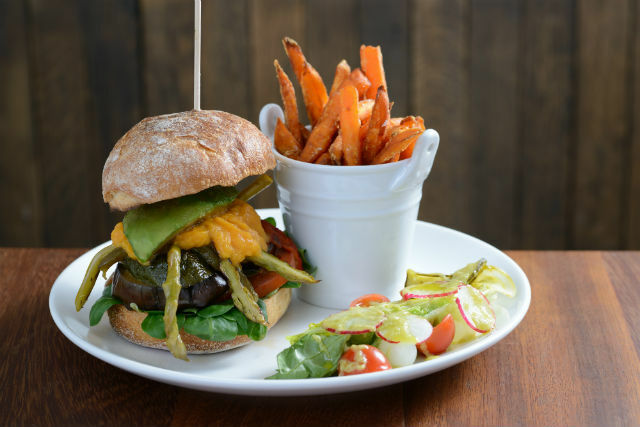 The burger is a colourful affair: a small, soft, brioche-like bun crammed with grilled asparagus, aubergines, courgettes, peppers, avocado slices, pumpkin purée and lots of rocket. It’s fresh and flavoursome but even though our beefburger-loving companion pronounced it “satisfying even for meat-eaters”, a slab of protein would have made it more substantial. Perhaps an old-fashioned bean, nut or tofu patty; or the option of cheese for vegetarians. It comes with a sprightly little garnish of salad and pickles. The accompanying shoestring sweet potato fries are over-cooked and over-brown, but the normal potato fries are beautifully crisp and moreish. 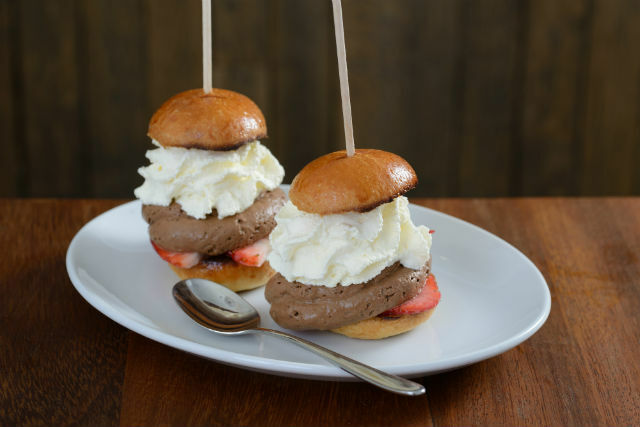 The ‘chocolate burger’ is in fact a platter of two little toasted sliders filled with strawberries, whipped cream and what appears to be chocolate mousse – more like a sort of cream bun. It’s rich yet light, just like the accompanying chocolate and caramel vodka. We also like the zippy lemon and intriguingly woodsy lingonberry vodkas that come in shot glasses filled with crushed ice. Pine kernel vodka has a pretty orangey-dusky pink colour and tastes more like citrus; and saffron is subtle and beguiling. Burgers and vodkas are not a natural match like, say, burgers and milkshakes or beers, so this unusual pairing has more of a curiosity value. It doesn’t feel gimmicky though, as vodka is very much the starting point of the place. The small venue is spread over three floors that look like a contemporary take on a Russian grandmother’s front parlour. On the ground level, there’s the main dining area with a tablet menu ordering system (though conventional paper menus are also available). Functional wooden chairs are draped with fake fur and tartan shawls, there’s a pretty glass screen by the entrance, a dresser with crockery and glasses and a payment counter that doubles up as a small bar, from which our solitary waiter poured the drinks. The cosy basement bar, which looks like a fun place to work your way through various vodkas with a small bunch of friends, has low seating and a piano recorder. Upstairs looks like somebody’s dining room, pristine yet with an air of ramshackle charm, complete with framed pictures. Apparently the restaurant opened less than a year ago with a menu of “fine cooking”, but changed to burgers around two to three months back. Our waiter added that they’re constantly experimenting and the menu may well change again in future. We paid around £30-£35 for two courses, three vodka shots each, and service. There were not many other customers on our early weekday visit, so the buzz came mostly from loud pop music, ranging from Eurythmics to Amy Winehouse. So the curious little venue is worth a visit pre- or post-theatre (Theatre Royal Drury Lane is just across the road), or if you’re in the area looking for something different. After all, a city in which every other restaurant seems to turn into a chain or an ‘offshoot’ needs more quirky and characterful places like these. Little Water, 19 Catherine Street, WC2B 5JS. Tel: 020 3659 3432.